It was funny to me, but in our reader survey, those of you who do AND do not wish this to become a parenting blog were very adamant. I totally understand that in the midst of such transition some of you are freaking out, but we’ve always said this will never be a parenting blog—and it will not. In fact, the only posts Laura and I have planned (besides maybe introducing our little cuties to you when they arrive) are a bunch of posts surrounding our nurseries (the same number as any other room… again—we’re STILL a DIY blog). Sorry for the nervous preface, haha. Our official statement is, “We are no more going to become a baby blog than we are a bathroom blog or a kitchen blog or a sofa blog.” You have my word. With that said, here’s a nursery DIY that I am so excited to share! I have been working on this room (slowly) for a few months now, and I think this will be the last little peek you see before my tour is ready. I stopped posting every little thing on IG so that it could be somewhat of a surprise for you, and OMG, it’s so hard not to overshare. Anyway! Shelves. We used this tutorial to create these shelves. We didn’t have to cut anything because the three foot boards were sold that way at the store. SUPER simple afternoon project! A friend of mine shared her nursery “must haves” list with me, which I have followed to the letter, and one of the sweetest things she insisted we include was a bookshelf low enough for our child to grab books from (even as a baby). The bottom shelf is reserved for board books and the upper shelves are where we are keeping the ones with easy to tear pages. I love this shelf solution because it doesn’t take up too much space. I didn’t want to do a huge traditional bookshelf because we didn’t have a free wall to devote to it, and also we have other large shelves in the house where I want to store children’s books. So I decided on this mini ledge shelf situation that’s just enough room for a rotating collection of favorites. Collecting books has become a big obsession for me. I even used this post as an excuse to order a few more books from my Amazon wish list. A few of these were gifts as well. Book links: The Mermaid and the Shoe, The Littlest Family’s Big Day, I Wished for You (our favorite adoption storybook), The Littlest Gardener (obviously had to have that one! ), Hug Me (thank you, Sherri), Gaston, Antoinette (super obsessed with the illustrations in both these), Last Stop on Market Street, Triangle, What Can I Be?, I Can Fly, The Ugly Duckling (one of my childhood favorites… thank you, Sheila),The Wonderful Things You Will Be, Home (A Chinese/English book… thank you, Mom! ), Day Dreamers, Dream Animals. Also, my wallpaper is by Lulie Wallace. It does feel so good to do some nesting in this space. Preparing a room for our little girl has been a great comfort to me on those random days when the waiting process feels like torture (which isn’t all that often, but it happens). The rest of my DIY projects I have planned for this room are more on the decor end. I want to make a lot of plush toys, and I’m hoping for the motivation to kick in to make some little clothes as well. Oh and I may try to build a mobile… I have looked everywhere and haven’t found the perfect one yet. Credits//Author and Photography: Elsie Larson, Project Assistant: Collin DuPree. Photos edited with A Beautiful Mess actions. Your wallpaper is so pretty! Thank you lady! Right when we started the adoption Lulie announced her wallpaper collection so it was fate. She is one of my favorite artists ever. I agree! That was my first thought too. It’s so sweet and lovely. I love to give books that are beautiful and funny. My favorites are What Do You Say, Dear? by Sesyle Joslin, the Stinky Cheese Man by Jon Scieszka, The Funny Little Woman by Arlene Mosel and I Want My Hat Back by Jon Klassen. 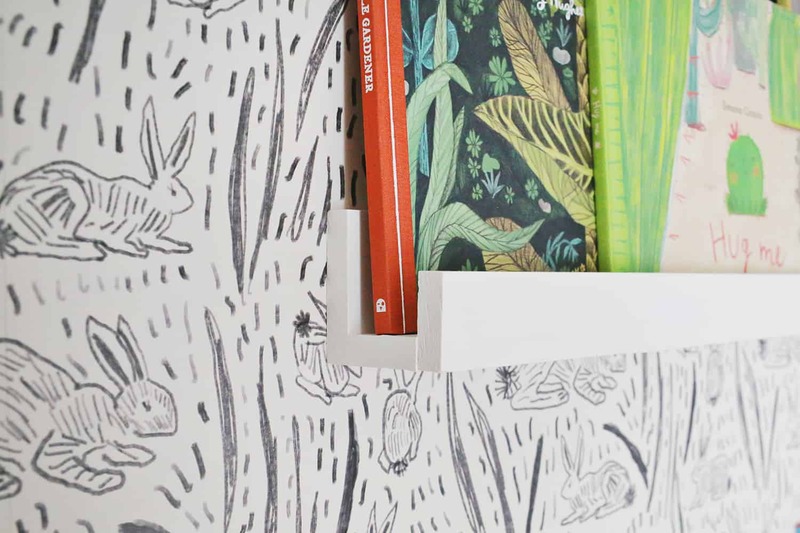 Sweet shelves and wallpaper! Can’t wait to see more. And, try “The Ox-Cart Man,” by Donald Hall. It’s a poetic trek through the seasons, following a New England farmer/father on his way to market. It’s a picture book, but not a baby book–your daughter can grow with it! The illustrations are charming and beautiful. I loved it as a child (and still do). The Ox-cart Man is one of our favorites too! I wholeheartedly recommend Ada Twist, Scientist and Rosie Revere, Engineer written by Andrea Beaty and illustrated by David Roberts for every little girl! They are fun, empowering stories and have beautiful, engaging illustrations! I would also vote down being a parenting blog. If Not for You by Bob Dylan and illustrated by David Walker is my favorite book to gift. 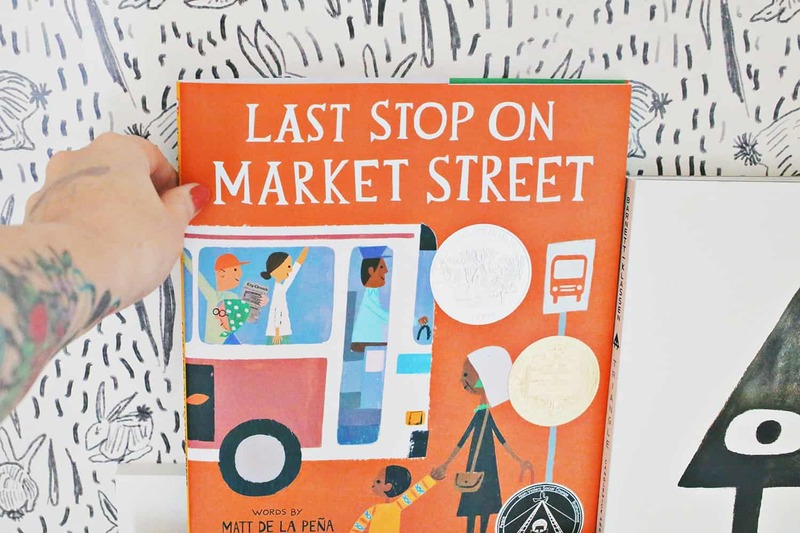 The song is so sweet reimagined as a children’s book and the illustrations are beautiful (and feature a little dog family!). I’m excited to see more nursery DIYs and room tours! I love these bookshelves so much! I can’t wait to try to make them myself. Also, I hate telling people what to do, but oh my goodness you NEED to get this book. My two-year-old LOVES it, as do all my nieces and nephews. It’s called Today by Julie Morstad. You won’t regret it. Every kid loves looking at all the things they could do that day and all the choices they get to make. It’s so sweet. Great for both girls and boys. elsie! i have two new books – one that just came out in March (WHAT WILL GROW?) and my first as author-illustrator coming in May (STACK THE CATS) — i’d love your girl to grow up with them! <3 email me! Haha, thank goodness. I know people’s lives change, but you guys have such a strong brand as a DIY lifestyle blog that I would really miss if you went full baby, so to speak. Katie I think our kids read all of the same books! My 22 month old LOVES to say GURUMPF! From “Blueberries for Sal,” and “Ada Twist Scientist” is an up and coming favorite. The first time she saw snow she shouted “A SNOWY DAY!” I think she loves books. 😉 Elsie– I’m sure you will adore the art in “I Can Fly,” but my daughter loves that too– she will randomly burst out “Bump bump bump, I’m a camel with a hump!” “Swish! I’m a fish!” Another favorite of ours is “Miss Rumphius.” We always end the book asking what we can do to make the world a more beautiful place. I don’t have a specific book, but a suggestion! I was adopted at birth and my parents frequently read me a picture book (I can’t find it on amazon – it was very 80s 🙂 about a girl who was adopted. I had heard the story so many times that I was later shocked to figure out that most of my friends and cousins weren’t adopted! I don’t think I fully realized that there was another option haha. Anyway – it’s a sweet memory and looking back, it helped my parents really normalize my birth story for me. This is the cutest! 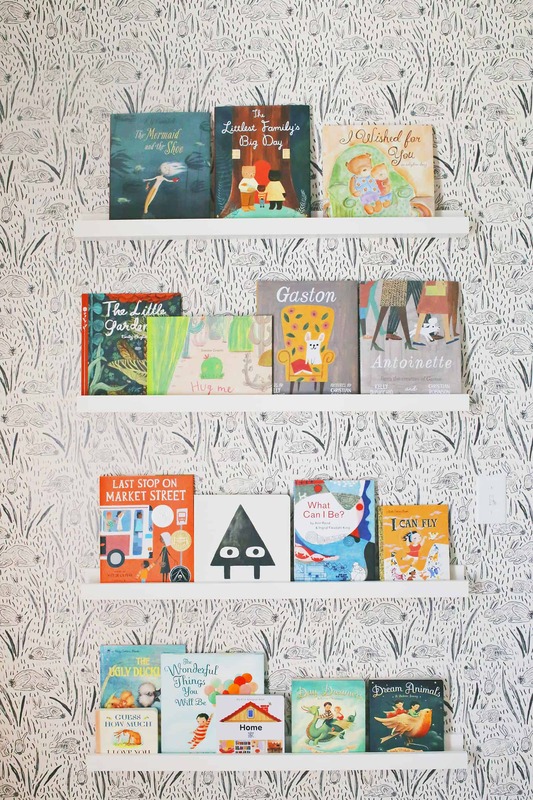 When I first saw this type of shelving used for children’s books I immediately knew that I ABSOLUTELY must do this for my kids one day. That wallpaper is so fun and unique too! Beautiful rabbit paper! If you are looking for a book to match – ‘Guess how much I love you’ about a big hare and a little hare and how much they love each other. Anything by Virginia Lee Burton has wonderful illustrations and excellent stories. My kids all loved her books. This is honestly a great idea for any room in a house! These are so cute! I totally want to make some for our kids bedrooms! I literally just ordered picture rails for Lucy and Juniper’s room last night, because I just either have too much on my plate or am too lazy to DIY a set! Ha! Also, you are right! We are in eachother’s heads with children’s books! Love it. Just Being Audrey by Margaret Cardillo is an amazing picture book biography of Audrey Hepburn and it has absolutely the most wonderful illustrations! And I love these shelves, essentially using the books as functional art! 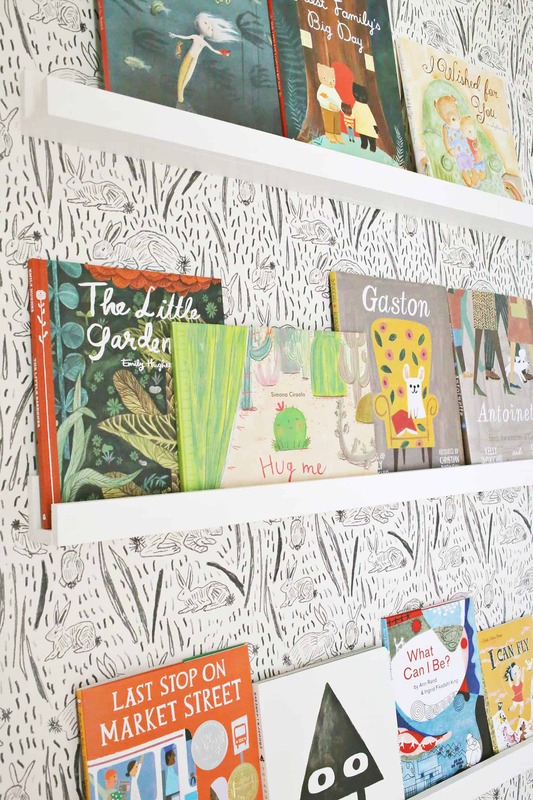 This book wall is perfect! And of course, Goodnight Moon by Margaret Wise Brown. I recommend focusing on strong writing rather than illustration. Also as the young one gets older, prioritize themes too- diversity, acceptance, gratitude, generosity, creativity. I love the classics- Eric Carle and Dr Seuss are musts in any child’s library, also snowy day, Knuffle Bunny, The Mitten, Billy Goats Gruff, Where the Wild Things Are. And books I really dislike, even though you didn’t ask- Goodnight Moon, and Giving Tree. Bleh! I love the books about the Bartholdy family, by Pia Thaulov. I think she is danish, like me, so I am not sure if you are going to be able to buy them in the US, though. ? But please check it out. There are no words in the books, but amazing pictures that tell stories all by them selves. ? This allows the kids to “read” them to you, instead of the other way around, so they really get to use their imagination. What a cute and practical storage idea! For beautifully illustrated books, I recommend the hat trilogy by Jon Klassen. In particular, “I want my Hat back”. It’s fantastic and so, so pretty. It’s a good story too, I actually can’t read it without laughing haha. That wallpaper, be still my heart. I love how the shelves allow the books to be art work. My bunny obsession needs it. this is so pretty and welcoming! And reading a lot of books together with your child is one of the best ways of bonding, I think. I like Steve Smallman’s books a lot — especially A Lamb for Dinner, A Hug for Humphrey and Gruff the Grump. He started out as an illustrator, but when he tells his own stories he works with different illustrators, so there is a wide range of styles. His way of telling stories is always very much his own, though! Jan Fearnley has done some great books, too. Oh, now I’m starting to write you a list that quickly grows far too long … so I’ll just send my best wishes! Enjoy every moment! The Gruffalo and the Gruffalo Child are amazing books by Julia Donaldson (she has other amazing books too). The BBC did a lovely animated short film of it. Best of luck with parenthood! It’s a roller-coaster , an amazing and beautiful one at that! Love the bookshelf! My favourite baby books are any from the babylit series, all the classics for babies! Beautiful nursery, and lucky little girl to have such a loving home to grow up in. Having raised four daughters, I really know children’s books! As far as beautifully illustrated, I love Chickens Aren’t the Only Ones by Ruth Heller. My girls all loved Richard Scarry’s Best Word Book Ever, not a beautiful book, but they wore out two copies of it. I just ordered a new book by R. J. Palacio, We’re All Wonders. I cried reading it, it’s that perfect. I’m going to give this book to every child I know. There are adults who could also benefit from it. Hi Elsie, I’ve been following your blog FOREVER. I’m currently a work at home Mom to an 11 mo. old little boy, and planning on one more. I’m dying over these posts. Like happily dying. I’m pumped for you and Laura, and I want more! I completely respect and understand your choice to not make this a patenting blog, but I desire it so strongly. I want to see outfits, diys, birthday parties, gifts, all of the baby things. If you have the energy to help a fellow Mama out I would be over the moon. Sending you love and good Mama vibes! They are worth the wait❤? that wallpaper is oh so adorable and begging to be coloured on too!! what a fun family project that would be! My daughter loves Gaston and whenever we read it we have to point out all the dogs on each page. I also second recommending Rosie Revere, Engineer and Ida Twist, Scientist. I also love the book Extra Yarn which has beautiful illustrations and a sweet message. I’ve also always wanted to have these shelves in my house so it’s good to see it’s an easy DIY. DEFINITELY “Where is my Hat?” By Jon Klassen!!! An instant favorite. We just found out we’re expecting baby number 3 and I’m totally loving this idea! I’ve got to do this for our little one, its so cute. And I love that wallpaper. I’ve gotten into ever since I discovered removable wallpaper. I can’t wait to see both nursery reveals. Love it! I’d be very interested in your friend’s “nursery must haves” list, if you could share it! Hi guys, sorry but this comment is not related to this post, but, since you updated your website (very cool BTW), it seems that I don’t receive new posts on Feedly. I would hate to miss some of your posts and thought I should mention it. It’s fixed today! I don;t know if it’s thanks to you or thanks for Feedly, but I’m happy! Tasha Tudor will always be my favorite children’s illustrator! She lived a long, simple, charming country life and with her family and Corgi’s. These corgis often ended up in her illustrations. Excuse me while I go look at my Tasha Tudor pinterest board! The wallpaper you chose is so cute! I love that you have to be close to it to see that they are bunnies- it creates a bit more interest to the space! 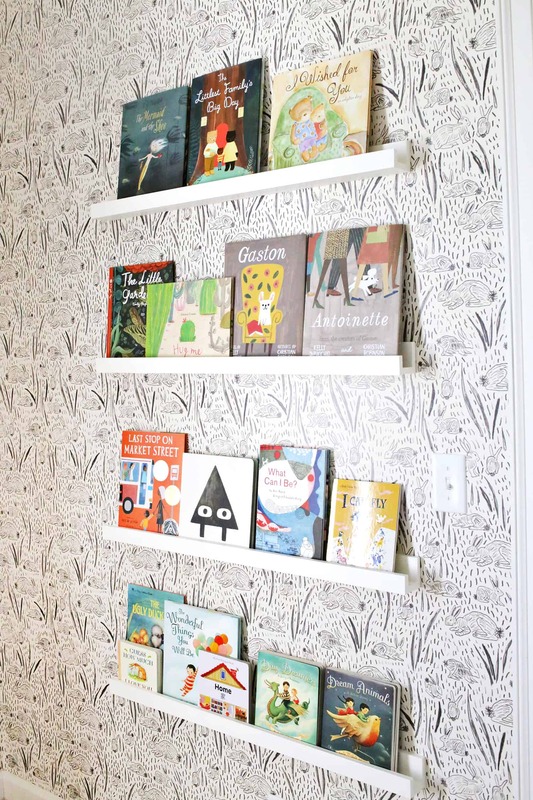 Also using books as your wall home decor is a great idea! Excited to see your nursery reveal. You need to check out ‘Home’, by Carson Ellis and there’s another lovely book called ‘Wild’, written by the little gardener lady. Both books have the best illustrations! Can’t wait to ‘meet’ your little girl! I can’t believe no one mentioned Peter McCarty! His books are unbelievably beautiful. “Press Here” by Herve Tullet is really fun. And I second Oliver Jeffers, especially “The Day the Crayons Quit.” Well illustrated children’s books are the best! Very lovely! I’d suggest All the World by Liz Garton. Pretty and rhythmic, just what I want in a read-aloud at the end of a long day. Loving that sneak peak of the nursery – stunning! In addition to what others recommended Jon Klausen’s We Foubd a Hat is adorable and charming. I love the color palette. It would work well for Laura because of the gentle desert scenes. Check it out! If you read it, I like to read it in Matthew McConahuey (sp?) voice! LOVE LOVE LOVE! I’m sorry that you have to write the big disclaimer in the beginning. I love following your journey through life as you share you creative spirit with us. Love the baby stuff, wedding stuff when that was occurring, and any other adventures you guys are having!! “The Little House” by Virginia Lee Burton- Ah! My heart! This story is precious. If you’ve ever loved a house, you’ll appreciate this one. “Tea Party Rules” by Ame Dyckman Very silly story about a bear learning the rules of having a tea party! “Kitten’s First Full Moon” by Kevin Henkes -Really anything by Kevin Henkes. His illustrations are sublime! One of my favorite children’s books is The Other Way to Listen by Byrd Baylor. It had a wonderful message and beautiful illustrations. Hi there! I am so excited for you and your adoption. My little one is adopted too so I have an adoption book suggestion:”A Blessing From Above.” It was really important to me to find an adoption story that emphasized (in an age appropriate way) how much the birth mother truly loved her child and this book really does that in just the sweetest way. I wish you and your sweet family all the best!!! A long a long road by Frank Viva. His illustrations are amazing! I’m curious- this post and the nail polish shelves were tagged as “renter friendly”. As a first time pregnant mom-to-be who just moved into a rental home- I’m struggling with wanting to decorate her empty “nursery” and not knowing how to do it without causing wall damage and possibly losing our security deposit! Is this truly renter-friendly and how? Thank you so much! SO many wonderful recommendations for books!! I would add Wild by Emily Hughes. She also wrote The Little Gardner which I see on your shelves. Both are two of our favorites. Also, you can preorder She Persisted by Chelsea Clinton. & this wall is beautiful, as are all your posts. Your blog is one of the few I still look at daily. & graduations on your adoption decision! Second, I know you don’t want a baby blog, BUT, we just had our first baby & please help!!! Stroller storage!!!! We don’t have a mud room, so my husband just built this beautiful storage bench. There is now no where to put the stroller, so it literally sits in the living room. You will definitely have a similar problem. Please help. It’s so dirty and tacky. Since Elsie and Laura are going to welcome two little girls, I want to suggest you “Good Night stories for rebel girls”. And the story behind the book is pretty amazing too.